A team of undergraduate students from the Lazaridis School of Business & Economics competed in the 38th annual Inter-Collegiate Business Competition (ICBC) in Kingston, Ontario. 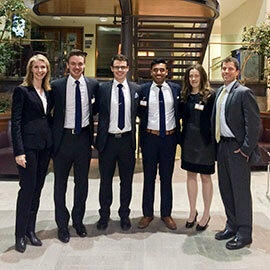 Lazaridis School students Carly Hicks and Faraz Noor placed second in the ethics competition, and David Clark and Eoin Ferguson were finalists in the accounting competition. Hosted by Queen’s University, ICBC is Canada’s oldest and largest undergraduate business case competition, dating back to 1978. In the fall, Lazaridis School students competed in the preliminary round, analyzing and solving complex business cases. The top six university teams in each of the eight events were then invited to the competition's Final Weekend Jan. 14 to 16. This year, the Lazaridis School team advanced to the finals in two streams: ethics and accounting. At the Final Weekend, delegates were given five hours to solve and prepare a new business case before presenting the case to a judging panel comprised of industry professionals and sponsor representatives. Assistant Professor Steve Risavy and Associate Professor Sofy Carayannopoulos served as faculty advisors for Lazaridis School's 2016 ICBC team.